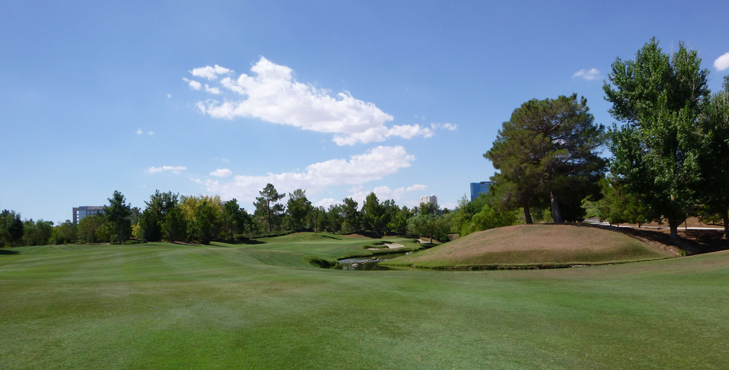 Wynn Golf Club Hole 3: This par four is fairly long and really is about the second shot. 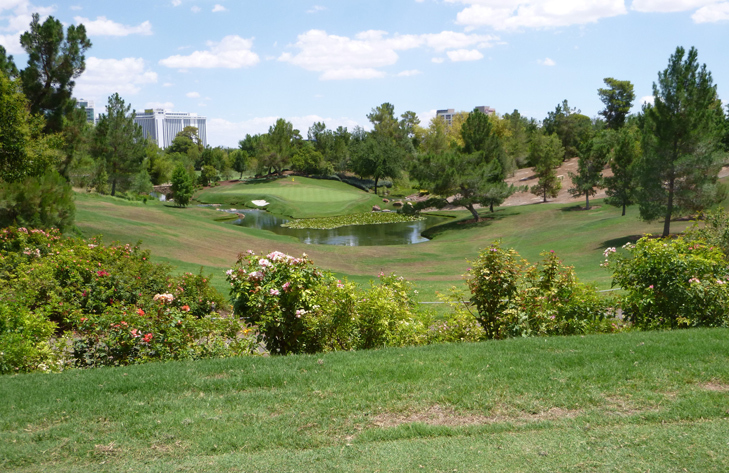 There is creek that protects the right side of the green (there are also two bunkers) that is angled so that any pin placement right of center is very tough..
Wynn Golf Club Hole 4: There are a few solid par fours at the Wynn that are similar in length and style. this is one of them that affords a straight view at the Stratosphere hotel in the background. it would be hard to argue one didn't have a good target to aim at. 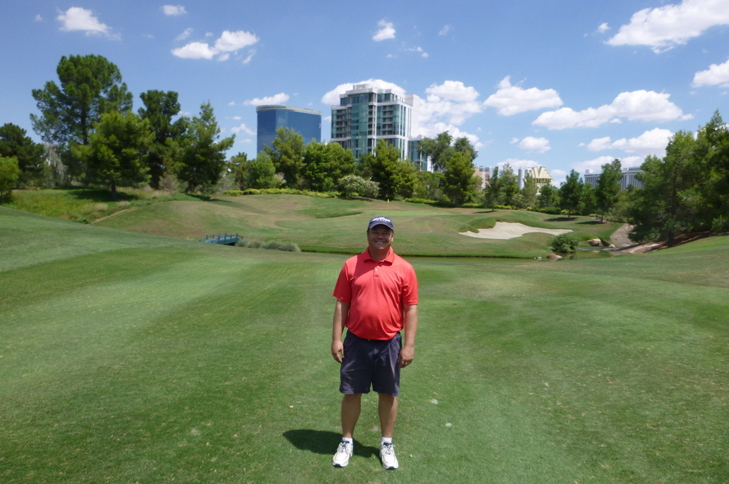 Wynn Golf Club Hole 6 (left): There are really good par threes on this course and I think this is the best. The drive is frames by trees and the water is definitely in play short and right of the green, which is deeper than it appears from the tee. Wynn Golf Club Hole 10 (below): This par five has a creek that runs down the left, which is definitely in play for all the shots. Going right, however, is not a great idea either as the fairway slopes right to left so any shots played from the right will head dangerously to the creek. 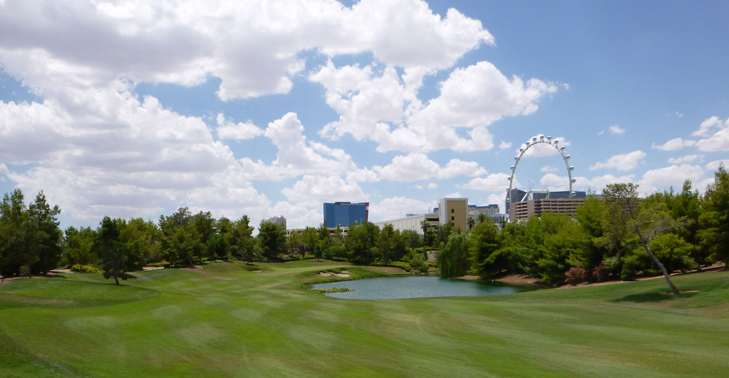 Wynn Golf Club Hole 11 (right): The second of three water-centric par threes, this one features a pond short of the green and a bunker to the left. Easier than the others, there is a definite bailout area to the right. However, the green does feature a tier, making putts tough. 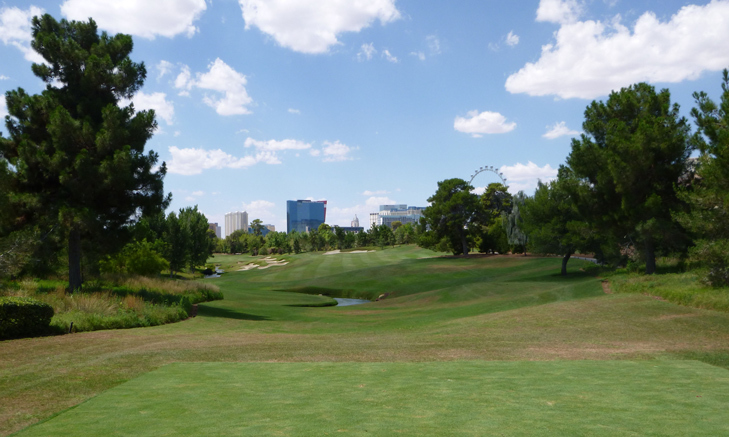 Wynn Golf Club Hole 12 (below): This is the last par five of the day, and it is the shortest, so pounding a straight drive can help the score. However, there is a creek that runs in front of the green and ends up to the right side of it as well, so caution must be exercised. 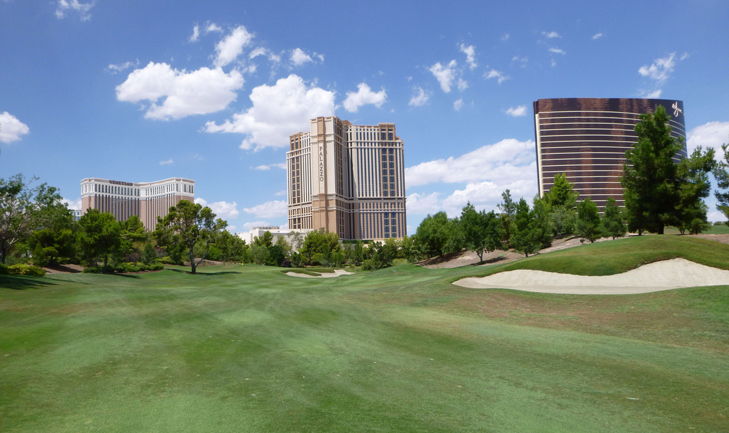 Wynn Golf Club Hole 14: This is a solid uphill par four with OB left that heads towards the strip. The landing area is pinched a bit by a well-placed bunker and the green is protected by another. Wynn Golf Club Hole 15: The last par three is not long, but has a lot of water to contend with that can certainly mess with a golfer's nerves. The green is deep and a back-left pin placement is terrifying. Wynn Golf Club Hole 17: This hole is long and nasty. The drive must be hit well and avoid the bunkers to the left side. The second shot has to contend with a large lake to the right of the green. Wynn Golf Club Hole 18: The last hole of the day also features quite a bit of water, with the lake to the left of the green being the most in play. 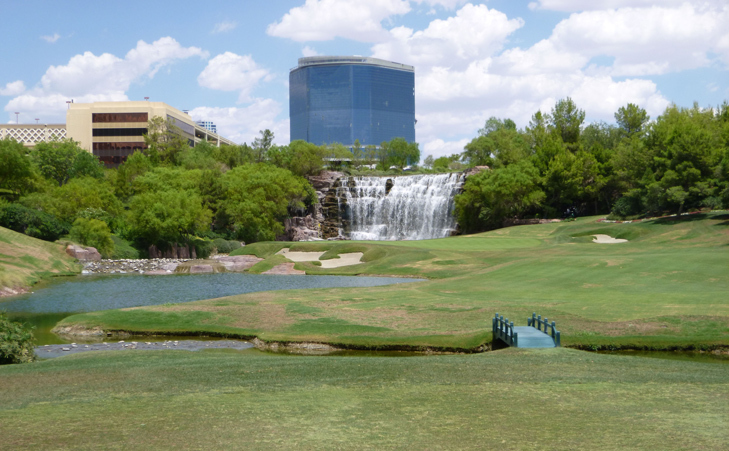 It also features a spectacular man-made waterfall behind the green that speaks volumes as to where one is finishing their golf round. 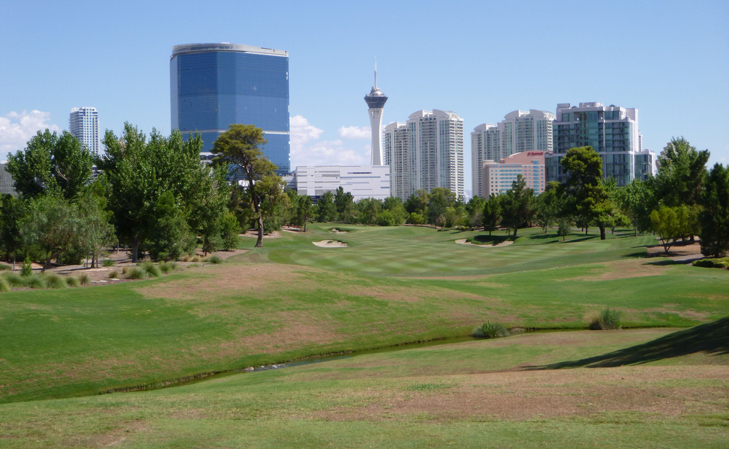 Want More Las Vegas Golf Course Reviews?? The Golf Course to Avoid?? ?